Showed at last year’s Photokina show, the GE PJ1 digital camera, it’s main party trick being an in-built Pico projector, is to go on sale in Australia soon. The PJ1 is 21.2 mm thick, has a 14.1 megapixel sensor, 7x wide optical zoom (28-196mm), 25 shooting modes, automatic face recognition and exposure adjustment, smile and blink detection, red eye removal, pan-capture panorama and optical image stabilisation. The pico projector is courtesy of a Texas Instruments DLP projector, with a contrast ratio of 300:1, 15 lumens, projecting 16:9 aspect ratio images of up to 70 inches in size. The camera can also connect to a computer, and then be used to project images, presentations, etc. It will provide up to 70 minutes of projection, and included with the package is a charging base that also functions as a stand for the camera while in projection mode, with an in-built fan to keep the device from running hot, plus preserve battery life. 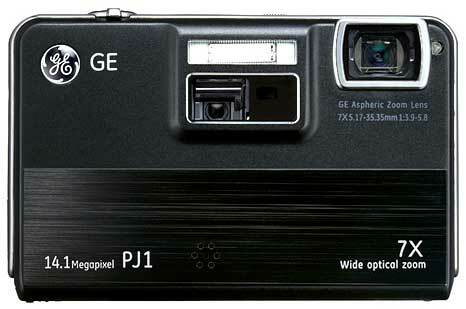 In addition to taking still images, the GE PJ1 also records video, in HD 720p. The GE PJ1 digital camera with in-built pico projector goes in sale in Australia in early- to mid-May, and will have an RRP of $449.